Cornell's new Human Ecology Building was completed in the fall of 2011 and marks the latest in sustainable strategies and educational architecture. Designed by Gruzen Samton • IBI Group, the facilities serve the College of Human Ecology, which is devoted to five interdisciplinary departments that respond to human needs with a variety of high-tech laboratory, classroom and studio spaces. 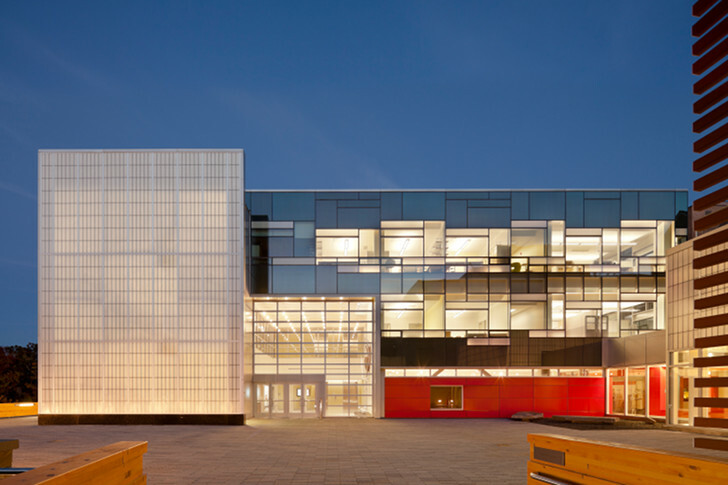 The building is characterized by a striking glass curtain wall system and its careful integration into the surrounding campus space. 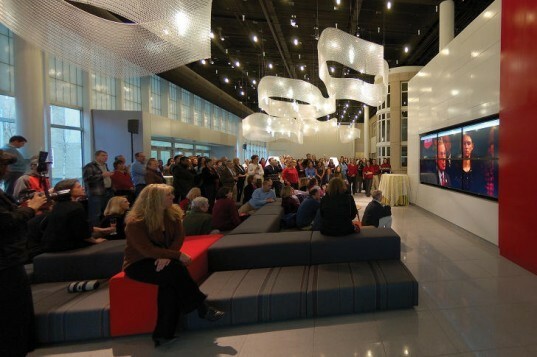 Cornell University is aiming to receive LEED Platinum certification. The Human Ecology Building was designed for a variety of departments in order to facilitate collaboration in a healthy and creative space. The new 89,000-square-foot facility features high-tech laboratories and classrooms, studios for drawing, design and fabrication, as well as a spacious gallery. Five departments make their home here now: Human Development (HD), Policy Analysis & Management (PAM), Division of Nutritional Sciences (DNS), Design & Environmental Analysis (DEA), and Fiber Science & Apparel Design (FSAD). Conveniently located on the Ithica campus, students and researchers have easy access to the rest of the school and experts which may be able to assist in their interdisciplinary work. Aiming for LEED Platinum certification, Cornell’s latest addition features the latest in sustainable building technologies as a way to aid the ongoing research inside. Daylighting permeates the interior through the innovative low-e glass facades that feature fritting. To reduce energy use, the building also has insulated panels, a high performance lighting system, occupancy sensors, and efficient MEP equipment. There is a green roof, sustainable landscaping, furniture salvaged and refinished from existing inventory, and an electric vehicle charging station. The Human Ecology Building was designed for a variety of departments in order to facilitate collaboration in a healthy and creative space. The new 89,000-square-foot facility features high-tech laboratories and classrooms, studios for drawing, design and fabrication, as well as a spacious gallery. Five departments make their home here now: Human Development (HD), Policy Analysis & Management (PAM), Division of Nutritional Sciences (DNS), Design & Environmental Analysis (DEA), and Fiber Science & Apparel Design (FSAD). Conveniently located on the Ithica campus, students and researchers have easy access to the rest of the school and experts which may be able to assist in their interdisciplinary work. Aiming for LEED Platinum certification, Cornell's latest addition features the latest in sustainable building technologies as a way to aid the ongoing research inside. Daylighting permeates the interior through the innovative low-e glass facades that feature fritting. To reduce energy use, the building also has insulated panels, a high performance lighting system, occupancy sensors, and efficient MEP equipment. There is a green roof, sustainable landscaping, furniture salvaged and refinished from existing inventory, and an electric vehicle charging station. The new facilities are used for everything from nutrition, to high-tech textiles, apparel design, and environmental design. A large open, multi-purpose space is used for events, speakers and exhibitions. Site plan of the Human Ecology Building.